My lawyer friend, Bhadarul Baharain bin Sulaiman wrote a Letter to Editors of The Star and NSTP to respond to the idiotic remark by Tan Sri Idris Jala but was not published. I am neither comfortable addressing him as Tan Sri Idris Jala (and will prefer to call him as Butcher from Shell or Butcher). 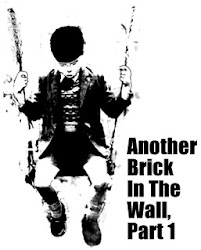 Nor am I comfortable with Butcher given the task of cutting the national deficit. When he was at MAS, Butcher had a habit of identifying the wrong problem, thus deriving the simplistic wrong and generic turnaround plan, and finally manipulate figures to lie the true failed results. In four years, MAS lost its domestic, Asean and China businesses and capacity to be a major player in the Airline industry. That is not all. The economy: Time for subsidy withdrawal symptoms? I AWOKE this morning (May 28) to the misfortune of having to read the headlines of two local English dailies of impending doom for Malaysia as a result of the manner in which our economy is structured, that being the various subsidies which, since gaining our independence, has been a pillar of the economy and magnanimously and benevolently extended to the rakyat by the government. Malaysia is truly a blessed country. We are a multi-racial, multi-religious and multi-cultural country. We coexist in peace. We have various natural resources and fairly good infrastructure. We can also be very proud of the various government-linked corporations that the Federal government has established or incorporated. Petronas, our national oil company, and Tenaga Nasional Berhad (TNB), our national electricity company, are fine examples, and the list goes on. I am just an average individual who works to earn a living and I have benefited from the magnanimity and benevolence of the government. As such, I cannot help but wonder how such gestures by the government these past decades can be the cause of impending economic doom for Malaysia. Truly amazing! Only recently, it was announced by the government and published in the newspapers that our growth rate in the first quarter of 2010 was at a 10.1 per cent. What a really fantastic growth percentage for Malaysia. And all this while, other countries worldwide are posting somewhat significantly lower growth rates. After all, Petronas has consistently posted huge and enormous profits since its incorporation. TNB, with its monopoly in the distribution of electricity in peninsular Malaysia, also continues to record profits. And yet, the government now has plans to remove most subsidies which the rakyat enjoy. I really wonder why. And now because of the various subsidies, Malaysia may be faced with impending economic doom. Are we not a country having some reserves of a sweet and light crude oil which sells at premium prices? Is Malaysia not a net exporter of crude oil when compared to our neighbouring ASEAN countries with Brunei being the exception? Why does the government compare our petrol prices with that of Somalia, Singapore, Thailand, developed countries around the world and other countries which are net importers of petroleum? Why is there no comparison being made with net exporting countries? Any comparison must be on an apple-to-apple basis. During the past 15 to 18 months, issues relating to the profits recorded by Petronas have been raised by various parties. By removing the subsidies for petroleum and diesel, there will inevitably be price increases for most goods and services. How then will the government extend the benefit of the profits of Petronas to the rakyat? It appears, to me at least, that the government, whether knowingly or not, keeps going back, again and again to tax the rakyat. I am quite sure that most individuals would not mind having to pay a bit extra for better services and conveniences. But how can the government expect the rakyat to pay any additional amounts when services and conveniences are substandard, well below par and not up to the rakyat’s expectations? The Lembaga Letrik Negara (LLN) or Central Electricity Board (CEB), as TNB was previously known, served social purposes as well. Included in the LLN budgets previously, were amounts for the expansion of infrastructure into the rural areas. These days, TNB talks not merely of profits but economic profits. When an entity has a monopoly, there should not be talk of profits, much less economic profits. It is easy to talk about raising tariffs to justify profits, making TNB seemingly a good investment for fund managers, but what about the rakyat? If TNB did not have a monopoly, by all means, increase the tariffs and let the rakyat choose which service provider they want. Level the playing field first! These are the types of arguments and contentions which give rise to further questions. What will happen to all the monies which will be made available as a result of the withdrawal of the various subsidies? We have all been told and have heard of the responses from the government that such monies will be utilised or have been used for projects which will benefit the rakyat. I would be most grateful if the government could provide details of such projects and please do not omit pertinent information, such as specifications and relevant costs involved. Most development projects can be calculated on a per square meter basis. I am not against the proposal to withdraw the various subsidies. However, the government should and must produce more detailed proposals with regard to the usage of all monies that the government will purportedly save from withdrawing of the various subsidies. As a Minister, Butcher cannot afford to shoot his mouth at will even though he is not a politician. It is because his words would have political implication. He works amongst politicians and his bosses are politicians too! Incidently, Butcher's remark duplicate exactly what was spinned by Lim Kit Siang in their campaign in Sibu as though Malaysia is going the path of Greece. Tony Puah had recently mention in one of his political statements that the national debt is RM360 billion. Did non-political Butcher leaked this information to DAP since he is known to be cordial and have celebrated Christmas with them last year? What made Butcher think he can simply shoot his mouth at will? He didn't shoot his mouth at will when he was MAS CEO. He even tried to cover-up operating losses by claiming MAS made profit but it was only for oil arbitrage revaluation. Back then, he knew market would panic and his MAS shares would plummet. But now he doesn't care if his remarks based on a worst case senario would make the rakyat panic. Butcher only care that the rakyat is swayed to support him through his misleading survey in the way Nor Yakcop supported his MAS turnaround plan even though both are blurred. Does Butcher he realised that by instilling fear of price hike and bankruptcy, he can cause financial panic too? Retailers and shopkeeper would raise prices ahead price hike announcements. When Pak Lah raised petrol by 78 sen, it cost his premiership. The public totally lost confidence with Pak Lah. By announcing at will price hikes of many goods, is Butcher trying to ouster Najib by making public lose confidence with his financial management ability? Is Butcher sabotaging Barisan Nasional? What more with Butcher's statement of bankrupt by 2019 had several weakness. One glaring weakness highlighted by Jebat Must Die is that he assumed debt is compoundable annually at 12% p.a. How could Malaysia possibly get into get a Greek crisis with positive GDP growth, balance of payments, billions in revenue, low inflation, payments on borrowed loans, and budgetary deficit of 5.6%? 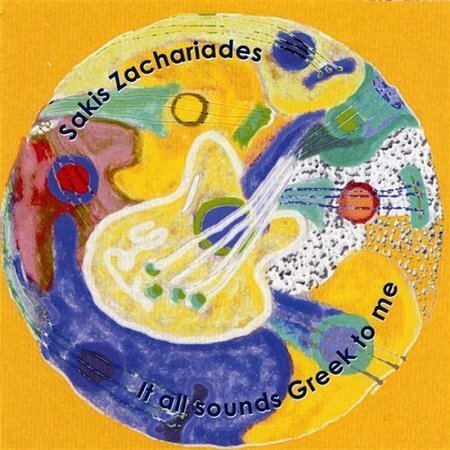 Malaysia is not in the same situation as Greece. How could cutting subsidy help improve conditions? Many are getting confused with such idiotic statements by Ministers. Does Butcher understand Government deficit financing differs than that of corporation? Government can easily issue Government Bonds in this highly liquid domestic banking system. Does Butcher understand that cutting subsidies at free will is not in tandem with the "rakyat diutamakan" slogan? Does he not have concern for his Kelabit folks in Sarawak suffering of low income and rising prices? How could Government cut subsidies and cause rises in prices when the high income model of New Economic Model failed to get endorsement of Majlis Perundingan Melayu? This makes this blogger sick with such Ministers shooting their mouth without understanding the implication of their statements. Can PM send this incompetent Butcher back to Shell? Israeli attack Gaza flotilla, 16 killed: Call for demo NOW! 31/5 Israeli warships attack one of 6 ships carrying aid for blockaded GAza, killing at least 2, Malaysians are on board one of those aid ships/STAR. My immediate thought and prayers for Matthias Chang, Shamsul Akmar and many other Malaysians and other activist in the Gaza flotilla humanitarian mission. Was just informed volunteers from groups like Jemaah Islam Malaysia (JIM) is probably in the first group of people being shot at. Matthias and Shamsul are members of the Perdana Global Peace Organisation volunteers that was part of this humanitarian mission to assist the Gaza Palestinians that have been blockaded from receiving supplies and aids since January 2009. There is a call on all Malaysian to put aside party politics and demonstrate in front of the US Embassy, British High Commision and United Nation office immediately. Update: Dr Mahathir will give a press conference at 4:00 pm at the Perdana Leadership Foundation (PLF), Presinct 8, Putrajaya. Majlis Perundingan Melayu (MPM) called for an emergency meeting at 4:30 at Kelab Sultan Sulaiman. PC at 6:00 pm. Blogger Greg Carlstrom gave a good honest rundown of the exercise here. 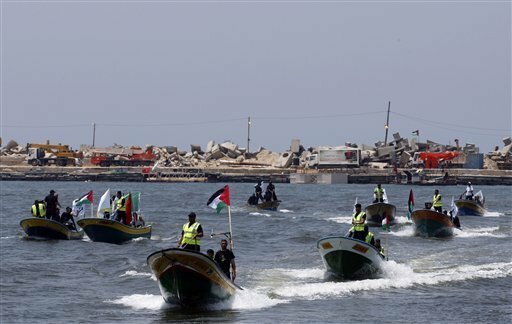 HAIFA, Israel (AP) - Israeli warships stalked a flotilla carrying hundreds of pro-Palestinian activists, including a Nobel laureate and a Holocaust survivor heading for the Gaza Strip on Monday, edging closer to a naval showdown on the high seas. Huwaida Arraf, one of the organizers, said the six-ship flotilla began the journey from international waters off the coast of Cyprus on Sunday afternoon after two days of delays. She said they expected to reach Gaza, about 250 miles (400 kilometers) away, on Monday afternoon, and that two more ships would follow in "a second wave." Israeli warships attacked at least one of the six ships carrying pro-Palestinian activists and aid for blockaded Gaza, killing at least two and wounding other people on board, an Arabic satellite service and a Turkish TV network reported early Monday. CNN Turk television in Turkey reported that two people had been killed and 30 wounded. The Israeli military denied that its forces attacked the boats but said they would enforce the decision to keep them away from Gaza. The al-Jazeera satellite channel reported by telephone from the Turkish ship leading the flotilla that Israeli navy forces fired at the ship and boarded it, wounding the captain. The Turkish NTV network also reported an Israeli takeover with gunfire, and at least two people were killed. The head of the Gaza Hamas government, Ismail Haniyeh, condemned the “brutal” Israeli attack. “We call on the Secretary-General of the UN, Ban Ki-moon, to shoulder his responsibilities to protect the safety of the solidarity groups who were on board these ships and to secure their way to Gaza,” Mr. Haniyeh told The Associated Press. Turkish television stations say police have blocked dozens of stone-throwing protesters who tried to storm the Israeli consulate in Istanbul after reports of the attack on the flotilla. CNN-Turk and NTV televisions show dozens of angry protesters scuffling with Turkish police, guarding the consulate in downtown Istanbul. The flotilla was “fully prepared for the different scenarios” that might arise, and organizers were hopeful that Israeli authorities would “do what's right” and not stop the convoy, she said. “If you ignore this order and enter the blockaded area, the Israeli navy will be forced to take all the necessary measures in order to enforce this blockade,” the radio message continued. The al-Jazeera satellite channel reported that the ships changed course to try to avoid a nighttime confrontation, preferring a daylight showdown for better publicity. Israeli Foreign Ministry spokesman Yigal Palmor said that after a security check, permitted humanitarian aid confiscated from the boats will be transferred to Gaza through authorized channels. However, Israel would not transfer items it has banned from Gaza under its blockade rules. Mr. Palmor said that for example, cement would be allowed only if it is tied to a specific project. Israel says the measures are needed to prevent Hamas, which has fired thousands of rockets at Israel, from building up its arsenal. But UN officials and international aid groups say the blockade has been counterproductive, failing to weaken the Islamic militant group while devastating the local economy. Mr. Palmor said foreigners on the ships would be “sent back to their countries.” Activists who did not willingly agree to be deported would be detained. A special detention facility has been set up in the southern Israeli city of Ashdod. “This could create more tension and trigger unpredictable reactions,” said the groups, which included Hamas and the militant Islamic Jihad. URGENT MSG: Salam YB ... latest news at GAZA waters - komando/navy zionist attacking FREEDOM FLOTILLA, shooting civilians-2 dead! tlg gerak SEMUA rakyat/parti politik demo at USA Embassy asap. ALLAHUAKBAR .. (apa pandangan.apa patut kita buat. minta respon) TOK HIM. Israeli soldiers boarded a Turkish boat carrying aid for the Palestinian territory of Gaza during a pre-dawn raid, the Free Gaza Movement said. "At about 4:30 am, Israeli commandos dropped from helicopter onto deck of Turkish ship, immediately opened fire on unarmed civilians," a post on the group's Twitter page said. Video aired on CNN sister network CNN Turk showed what appeared to be soldiers rappelling onto the deck of a ship. Turkish media reported two dead and 50 injured in the alleged incident as a flotilla of six ships approached the Gaza coast. "We did not attack any boat, we merely fulfill the Israeli government's decision to prevent anyone from going into the Gaza strip without coordinating with Israel," a statement from the Israeli military said. "The flotilla is a provocation made to de-legitimize Israel. Had they really wanted to deliver the cargo into Gaza they could have done so via Israel as it is done on a daily basis." The convoy of boats approached Gaza in defiance of an Israeli blockade and had been shadowed by three Israeli warships. Free Gaza had earlier reported that they had been contacted by the Israeli navy. If you’re hoping to see news about the extraordinary events taking place in the Med sea around Cyprus on either the BBC or Sky this weekend. Forget it. For now. Despite the fact that almost three dozen Brits are amongst the 700 brave souls heading to Gaza on a fleet of ships laden with essential aid. Or the incredible military and political manoeverings surrounding Israels response to the peaceful attempt, major news channels in the West remain silent. This despite the fact their news editors have the direct numbers of spokespeople on board and access to the live news feed. After calls to newsrooms across the UK it is clear to me that the first ever sea bound fleet of international aid to Palestine is not of itself a big enough story for our media - until if fails. On Israel’s terms. The BBC has been taking some 200 calls in an hour from viewers wanting news of the mission - to no avail. JERUSALEM, May 31 (Xinhua) -- Israeli forces on Monday attacked an international flotilla carrying aid to besieged Gaza, killing up to 16 and wounding more than 30 others, an Israeli television reported. The clash happened after Isreali soldiers tried to stop the flotilla from reaching Gaza. Israel's private Channel 10 television said Israeli forces opened fire after being attacked by a number of passengers. The Isreali Army Radio also put the number of deaths toll at up to 16, saying that more than 30 others were injured. 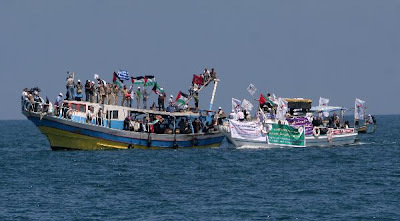 The flotilla consisting of six ships were carrying about 10,000 tons of aid and activists who were making an attempt to break the blockade on Gaza. Israeli commandos dropped from a helicopter onto the deck of a Turkish ship at about 4:30 a.m. and immediately opened fire on unarmed civilians, said a twitter of the human rights group Free Gaza Movement. Turkey, once the number one destination for organized workplace vacations, is now facing a boycott from the same groups that used to storm its seaside resorts every summer. On Sunday, a survey conducted by Va’adim, a company that gathers information on the social and economic activities of Israel’s unions, revealed that 95 percent of the unions had banned all organized trips toTurkey following that country’s involvement in organizing the aid flotilla to the Gaza Strip. “In a survey we conducted among the participants in the semi-annual union heads forum, we found that Israel’s workers’ unions have had enough of Turkey ’s hostility toward Israel, which in the past had been characterized by verbal attacks by the country’s prime minister, but had now shifted to active attempts to harm Israel’s sovereignty,” said Alush. Organizers of a flotilla of up to nine vessels carrying hundreds of pro-Palestinian activists and thousands of tons of supplies for Gaza protested on Friday against what they called an Israeli disinformation campaign aimed at their mission. Israel has vowed to stop the boats from reaching Gaza, which is controlled by the Islamic militant group Hamas, and insists that there is no humanitarian crisis in the Palestinian coastal enclave. More stories in Goggle News on Gaza Flotilla here. Kongres Ekonomi Bumiputera ended yesterday with Dato Najib consoling those present that the New Economic Model (NEM) is not finalised. It is merely a proposal by National Economic Advisory Council (NEAC) to the Government and is undergoing due consultative process. He assured that the Bumiputera’s economic interest and affirmative action would not be sacrificed but remain. If that had been so, the red covered document of the NEAC should not be presented with a Government emblem. The evening crowd of the event organized by the Majlis Perundingan Melayu (Malay Consultative Council) was a tamer one than those attending the morning session. The crowd were smaller but were capable of beheading NEAC Chairman, Tan Sri Amirsham Abdul Aziz on a guillotine. Prof Dr Norma Mansor, Secretary of the NEAC came unprepared for the topic was asked to answer or end her presentation. Most of the attendee had heard the NEM briefing repeatedly and were seriously posing her to answer the topic: Memperkasakan Ekonomi Bumiputera. During the review by Senator Dato Akbar Ali, the crowd was howling and hurling insults at Norma and NEAC for every agreed point presented. (Presentation available here) The NEAC was exposed to have made serious theoretical error, and ill- intentions to ridicule NEP and smear the era of Tun Dr Mahathir. In one private engagement between Tan Sri Amirsham Aziz - the so-called Malay Chairman of the NEAC but allowed minority and foreigners to overwhelmed the NEAC Membership, he said that New Economic Policy (NEP) was the reason that Malaysia lost it's competitiveness. It is as though the NEAC are conceding defeat from achieving the desired outcome. Is she saying NEAC was doing economic planning without any inkling of the desired outcome? This is in contrary to Dato Najib emphasis on outcome. What do expect from a Chairman who knows nuts and was placed there to serve the corrupt and multibillion Ringgit loser, Tan Sri Nor Mohamad Yakcop and the agenda of Kalimullah? Dato Halipah Esa, former Director general of EPU burst to tears several time in her presentation to review the NEAC proposal. (Presentation available here) She went at length to expose how NEAC totally ignored the plight of the Bumiputera majority. It must have been unbearable for her to foresee the terrible implication. Unlike the stereotyping and perception played by scrupulous Malay liberals and non-Bumiputera at such groups, they were equally sharpened vocal in the resolution session towards culprit politicians or corporate businessmen responsible for leakage of the NEP. GLC CEOs and Members of the Board of Directors were equally scrutinised. The whole member of the board of Directors of Sime Darby was demanded to vacate. The name of Petronas director’s Omar Ong and Dato Shamsul Azhar was loudly mentioned publicly for instrumentally destroying Petronas as a successful Malay organization and hurriedly dismantling it to for easy entry to “Chinese” without due process. This crowd means business and by the look of things, they are not the usual timid and pembodek UMNO crowd one usually see. This is the real fighting UMNO and they are capable of making or breaking UMNO. This will be more significant with Malay patience now reaching its brink after Government have been kow towing to Chinese demands for the sake of votes but was not delivered and yet the Bumiputera majority voters are taken for granted. This is only the beginning. Many UMNO leaders like Nazri Aziz are still lost in their ego for not taking this crowd seriously. Let they be warned for forsaking them come with its own peril. You are hereby warned! This news portal is better known for its spin tactics and telling of half truths which is worst than a lie. Despite being amongst the first in churning out free stories, readers have to take in the news reports with a pinch of salt or hold back until the contents are verified by other news sources. So much for professionalism, integrity and fair reporting. The only thing holding back The Malaysian Insider is themselves. They have been caught red-handed on numerous occasions misrepresenting the facts, maliciously misquoting and casting stories on issues of politics, race and religion in a way that serves an insidious purpose. 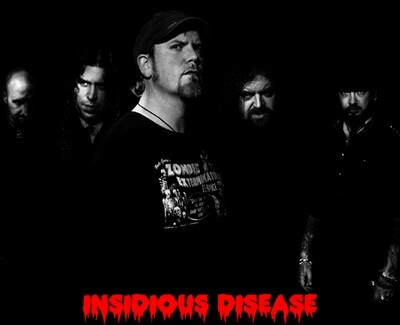 Read "The Insidious Insider" here on Malaysia Today. Keeping impartiality is of course a foregone conclusion when even their executive editor takes sides in the political fray. Read "Leslie bends over backward for Khairy" on Malaysia Today here. And recently, this online spin portal was back to its dirty tricks by substituting the words ‘Mengambil Kembali’ for ‘Rampas’ in their latest piece on Mukhriz Mahathir’s latest statement on the rumoured dissolution of Kedah state assembly. This was following murmurs of severe discontent within the Pakatan Rakyat state government and indeed Mukhriz’s take on the fluid national political scenario. No other news source used the word ‘Rampas’. In their desperation to spin precludes the fact that in the context of the headline and indeed the entire report, the word ‘Rampas’ and ‘Bermaruah’ is spitefully oxymoronic. And perhaps the most telling sign of a spin doctored piece is the absence of credit to the reporter. When you know you’ve done something wrong, whose going to lend their name to it? That’s ethical journalism for you. I wholly agree and support the above. If you agree with this call, do post the above poster on your blog and express yourself. The political reality is that the new politics of today could not afford a tainted politician. More so, one that was directly responsible for the loss in confidence towards Government during General Election of 2008 and in which the damage has yet to be repaired and remain till to-date. Dato Seri Najib cannot afford to maintain incompetence and liabilities as Ministers in his cabinet. Those that have not performed and prove to be of limited capability should be replaced, irrespective of their position in their political party. And those believed to be corrupted be put "on leave" and undergo thorough investigation. While those with image of corruption not be considered for any post in Government or party. Voters confidence will only return if those corrupted heads rolled off the chopping block. Repeating the message again, heads must roll. Until corruption at the highest level of Government and Barisan Nasional is seriously addressed, that will remain the main stumbling block for voters confidence to return Barisan Nasional. No member of the previous Prime Minister family member that was part of his inner circle of Government and responsible in instituting policies detrimental to the nation be given opportunity to participate in Government. They have done enough damage and it is unfair that they do not suffer any retribution. 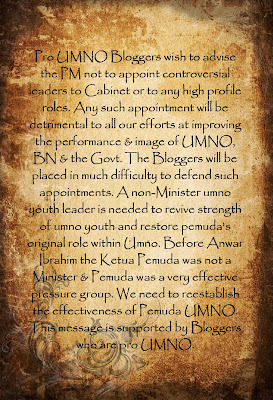 Dato Najib should heed this reminder from pro-UMNO bloggers. Otherwise, it will be difficult for us to continue to defend the Government with personalities like Nor Mohamad Yakcop, Khaled Nordin, Ismail Sabri, etc still remain. The list is not limited to just them. It is high time that position in cabinet be distinguished from position in party. Ministerial position must give prime consideration for their capability and capacity. Until proven at Deputy Ministerial level, Minister position is meant to only those capable and with the capacity. Bloggers pro-Umno ingin mengambil kesempatan ini untuk menyuarakan pandangan bahawa sebarang perlantikan pemimpin yang dilanda kontroversi ke Kabinet ataupun mana mana jawatan berprofil tinggi hendaklah dielakkan pada masa kini. Dengan sebarang perlantikan yang berbaur kontroversi, maka akan tempanglah semua usaha kita untuk meningkatkan prestasi dan imej Umno, Barisan Nasional mahupun Kerajaan Pusat. 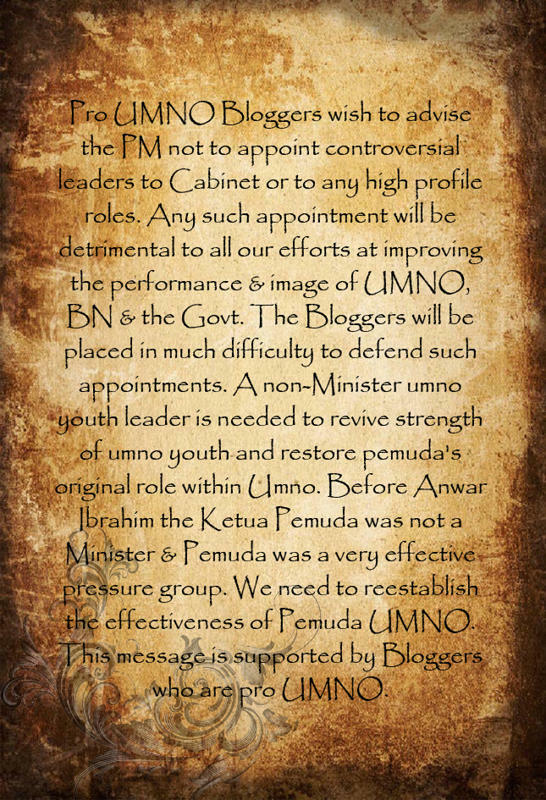 Bloggers pro-Umno juga akan merasa lebih tertekan dalam usaha mereka menyokong usaha Umno kerana mereka tidak mungkin mampu mempertahankan keputusan melantik seorang pemimpin yang terpalit kontroversi ke Kabinet. Di ketika getir ini, kita memerlukan seorang pemimpin muda yang mampu menyatukan sayap Pemuda Umno yang kian robek kerana Pemuda adalah penyumbang penting dalam perjuangan parti keramat kita. Sejarah telah menunjukkan bahawa Pemuda mampu bertindak sebagai suara kritis yang lantang lagi bernas tanpa memberi ketuanya sebarang jawatan Kabinet, malah keputusan memberikan Anwar Ibrahim jawatan cabinet sempena kedudukan beliau sebagai Ketua Pemuda mungkin sekali telah menjadi punca Pemuda kian kusam, gusar dan capet. Umno amat memerlukan tenaga Pemuda ketika generasi baru semakin meminggirkannya, dengan itu kami ingin menyeru dengan lantang agar Perdana Menteri tidak melantik Ketua Pergerakan Pemuda Umno ke Kabinet. Seruan ini disokong oleh para blogger pro-Umno. A Malay version poster to come soon. BUM 2010 Tomorrow: Hot and explosive! BUM stands for Bloggers Universe Malaysia (BUM). BUM2010 is the fourth in a series of annual gatherings of Malaysian bloggers and bloggers-to-be, and is being organized by a group of mainly Socio-political (SoPo) Bloggers in their individual capacities in association with the Protem Committee of the National Alliance of Bloggers (All-Blogs), and the Centre for Policy Initiatives (cpiasia.net). BUM2010 is a non-profit initiative, and any fees received go towards defraying the costs of organizing the one-day “Bloggers Event of The Year” to mark World Press Freedom Day which falls on May 3. The previous BUMmers outings had seen rising attendance, starting from 150 for BUM2007, to 180 for BUM2008 and to 200 for last year’s BUM2009 (REF:bum2009.wordpress.com). The Event is open to all comers, even non-Bloggers, on a first-come-first served basis.OFFICIAL REGISTRATION PLUS FEES PAYABLE DETAILS please go here. This is the same position taken by all Chinese based political party and think tank, IMF/World Bank inclined opinion makers, and Anwar Ibrahim in his "Harapan Baru Untuk Malaysia" Economic Manifesto produced before 2008 General Election. Amirsham was not thinking independently and analytical in his Chairmanship of NEAC for his is regurgitating the views of others. Using that stand on NEP, NEAC proposed the New Economic Model to the Government. All form of affirmative actions and Article 153 based NEP like assistance was removed. There was initially no mention of Bumiputera and affirmative action in the whole NEM document until Perkasa call pressured the Government to "reinstitute a market based and transparent affirmative action" back into the model. The NEM has yet to start and the economy is still running from the remnants of NEP and NDP but Malaysia was reported to have jumped up 8 notches in terms of competitiveness to emerge in the world's top 10 competitive nation. KUALA LUMPUR, May 19 (Bernama) -- Malaysia has emerged the world's 10th most competitive nation from 18th previously, a remarkable jump brought on by significant improvements in economic performance due to a host of factors such as influx of quality investments, pragmatic government policies and low risk political instability. In giving Malaysia high marks and propelling its position by eight notches, the International Institute for Management Development (IMD) in its World Competitiveness Yearbook 2010, said other telling factors were its effective implementation of government decisions, mainly attributable to the able stewardship of the economy by Prime Minister Datuk Seri Najib Tun Razak. Also commendable was the adaptability of government policies to economic changes, it said in apparent reference to the RM67 billion stimulus package unveiled by Najib, who is also Finance Minister, to mitigate the economy from the global slowdown due to the fallout from the US subprime credit crisis. Najib's unveiling of the New Economic Model (NEM) aimed at transforming the nation into a high-income economy has been able to sustain and position Malaysia on the right path towards attaining developed nation status by 2020 also was a strong feature of the adaptability of government policies to changes in the economy. The IMD World Competitiveness Yearbook (WCY) is the world's most renowned and comprehensive annual report on the competitiveness of nations, ranking and analysing how a nation's environment creates and sustains the competitiveness of enterprises. It also said in the first 10 places, Australia was at fifth spot, Taiwan at eighth and Malaysia at 10th placing, benefited from strong demand in Asia and implementation of efficient policies. "The three nations rank very well in government efficiency," the IMD said. Malaysia was also ranked highly, thanks to what IMD said was the strong resilience of the economy to (down) cycles, sufficient transparency among financial institutions and government bureaucracy not being a hindrance to business activity as evident from the rapid expansion in the economy over the past year. After languishing from the global economic crisis, the economy recovered in fourth quarter of last year by 4.4 per cent and even more remarkable by a 10.1 per cent in the first quarter of this year. Among Malaysia's strength which ranked it to the top was its economic diversification and exchange rate while for current account balance it was ranked second and third for exports of goods. The competitive cost of capital, which encourages business development, the ageing society not being a burden for economic development and unemployment legislation providing an incentive to look for work were also strong points of the econony. The good news for corporate employers in Malaysia was that competent senior managers were readily available in the country, corporate boards supervise the management of companies effectively while entrepreneurship of managers was widespread in business. Malaysia also continued to intensify life-long learning and nurture a talented workforce while it also drove productivity and competitiveness through creative and innovative mindsets. The IMD also said the transparency of government policies was satisfactory, having improved from 3.94 per cent to 5.98 per cent, while protectionism was not a factor in Malaysia's economy as it did not impair the conduct of business. It said the high rating was also due to quality investments which strengthened the economy and action to groom the small-and medium-sized enterprises for global competition. Improvements were made in other areas including corruption, bureaucracy, transparency, political stability, long-term unemployment, corporate debt and consumer price index. In sub-sector rankings, Malaysia topped in financial institutions transparency and low risk factor in financial institutions. Malaysia's financial sector remained resilient despite the meltdown in the US and Europe financial sectors, having managed to strengthen further its presence in the financial landscape especially in Islamic finance and banking. Malaysia is now a world leader in Islamic finance, capital market and takaful industries and there is huge potential to become a hub for integrated Islamic financial services. 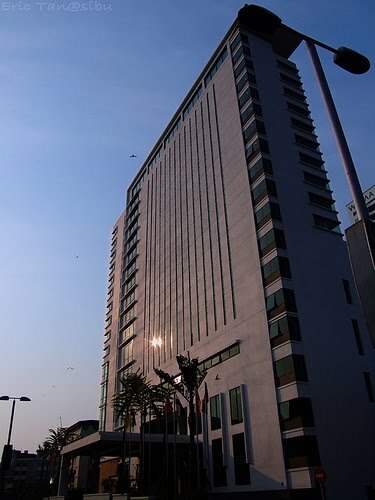 For instance, Bank Negara Malaysia was currently finalising the establishment of a physical Islamic financial centre and the imminent approval of two mega Islamic bank licences. The ringgit, at a high of 3.1 to a US dollar, has been the strongest performing emerging Asian currency against the greenback so far this year, gaining more than seven per cent on the country's strong growth prospects. It also appreciated against the euro by 19 per cent against the euro and 16 per cent compared with the pound. For public and private sector ventures, funding for technologies, science in schools and high technology exports, the country was ranked fourth best, the IMD said. The IMD said science in school was sufficiently emphasised. Under the government efficiency sub-ranking, Malaysia was ranked second for capital cost as there was support for business development. It was also ranked second for adapting government policies to changes in the economy. The IMD however did point out some weaknesses in its ranking for Malaysia, including high government subsidies to private and public companies as a percentage of Gross Domestic Product, redundancy costs, government's budget deficit and high number of procedures to start a business. One wonders whether NEAC got their analysis right or is influence by personal prejudice of its members? Malaysian economic was robust during the NEP days. Stock market was booming. Investment was abundant. Business ideas was flourishing. The notion that NEP was the reason Malaysia lost its competitiveness was absurd. 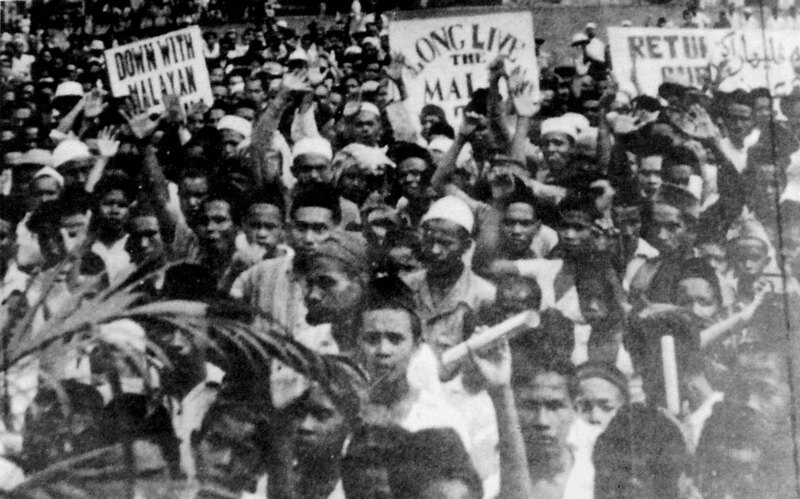 It was during the NEP era that all Malaysian enjoyed peace and prosperity. Although NEP was meant to revive the economic sector of the Bumiputera, the non Bumiputera benefited along from the growth driven NEP. Unlike the NEM, which is too focus on business sector needs, the NEP was a more wholesome economic policy that meets and covers the social, political and security aspect of the nation. Did Amirsham tried to coverup Abdullah's economic fallacies by blaming it to NEP? It was during Abdullah's era that he clamped down on spending and personally halted economic growth. His policy and inability was reasons investment fell sharply. There was sufficient money but he refused to spend on strategic projects already planned. He claimed there was no money and blamed on dr Mahathir's administration but it turned out RM290 billion spending of Petronas money could not be answered. Abdullah diverted money into the unproductive economic corridors. And, Amirsham wasted billions of Maybank money into the overly priced BII. He didn't even dare answer to Lim Guan Eng's question in Parliament on Maybank when he was Minister. Thus, it is really not about NEP but more of incompetence, isn't it? The Cabinet should seriously restudy NEAC's proposal. Lawatan saya melawat rumah panjang mengikuti rombongan Menteri Pembangunan Luar Bandar, Dato Shapie Apdal meninggalkan kesan yang mendalam buat saya. Secara kebetulan, hari mengundi di Sibu ini juga adalah hari Guru. Ingin saya dedikasikan sajak Usman Awang ini kepada guru-guru di sekolah-sekolah pendalaman yang berkorban membela generasi hadapan kita dengan segala kekurangan dan kekangan. Mereka adalah pejuang yang perlu dihargai. 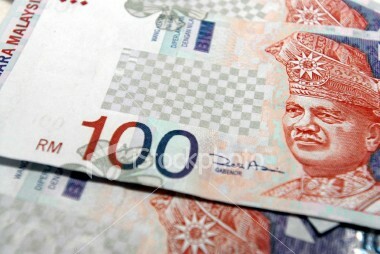 The Malaysian economy recorded a growth of 10.1% for first quarter of 2010. This is the highest quarterly growth in 10 years with the last such high of 11.7% in 2000. That 2000 high growth signaled the upturn in the economy after undergoing the currency crisis of 1999. The latest figure indicates the economy is finally emerging after the slowdown from the global economic crisis. It proves Najib's stimulus plan is bearing fruit. Voters in Sibu should use this opportunity to endorse PM's economic agenda by giving Barisan Nasional a resounding victory in Sibu. After 7 days of campaign and the sickening campaign by DAP to play on the sentiment of the local Foochow Chinese, a good majority will be the much needed answer to the racial and religous slant of the DAP campaign. If the Sibu Chinese realised, it is Najib's programs and Government that will meet their expectation for the peace and prosperity to pursue their commercial interest and family economic stability. The DAP campaign in Sibu started on a note for change but took a drastic change for a more vicious and extreme stance to instigate Chinese and Christian sentiment. According to Lim Kit Siang's calculation, DAP is targeting 80% of the 65% Chinese voters to secure about 50% of the votes. In past elections, DAP could only secure at best 60% of Chinese votes. To the chagrin of the local DAP leaders, DAP Semananjung leaders have dominated the DAP campaign to the extend of instilling fear within Chinese voters. Such extreme words of accusing Malay-led Government would drive out the Chinese of their land were uttered in ceramah. And, Mat Sabu willingly endorse Lim Kit Siang and DAP leaders as good people in the same ceramah. Theresa Kok and Ngeh Koo Ham pursued to split the Christian votes on the Methodist church platform to criticise and accused UMNO Government of driving towards Islamic state. They went to the extent of lying to the politically innocent East Malaysian crowd and endorsed by former Perak Menteri Besar, Mohd Nizar Jamaluddin that PAS is not pursuing for Islamic state. PKR and PAS was assigned to split the Malay and Iban voters by sowing discontent using local issues such as the complex Native Customary Rights land, basic needs and development. The irony of DAP's 7-points Manifesto was that DAP promised to solve the local woes by giving a two-year commitment only after DAP takeover the state and federal government. That is as good as no promise. The issues raised and promises made by DAP to the voters, particularly Chinese voters and PKR and PAS to the Malay and Iban voters are in conflict with both their ideology, struggle and issues they raised in Peninsular and with each others' ideology, struggle and issues. Strangely, PKR spoke out about Rosli Dobby and Malay nationalism in last night's ceramah to the Malay. They provoked the Malays not to vote for Chinese SUPP. Till noon, this blogger is still struggling to figure out if DAP candidate's Wong Ho Leng is not Chinese. BN had problems with their recent slackening of Sibu and Lanang ADUNs and machinery had left personal attack levied at Ketua Menteri Tan Sri Taib Mahmud left unanswered. That was overcome by the presence of Dato Seri Najib and Tan Sri Muhyiddin to meet the common people have really touched the heart of the locals. The negative and aggresive campaign of Pakatan had an initial impact but its influence on voters have since wane off. Common sense should prevail with the recovering economy. 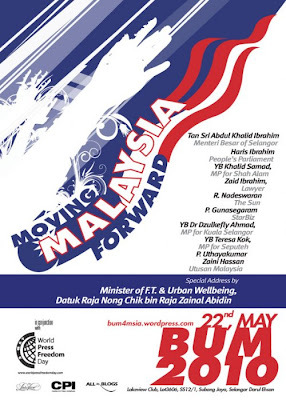 KUALA LUMPUR, May 14 (Bernama) -- Economists have given Prime Minister Datuk Seri Najib Tun Razak full marks for putting the Malaysian economy on "full throttle" mode. Dr Yeah Kim Leng, Group Chief Economist of RAM Holdings, acknowledged that Malaysia's quick economic recovery has been due to Najib's stimulus plan. "When Prime Minister Najib took office, it was at the height of the global financial crisis. What we see here is that the PM has passed the most critical challenge of ensuring that we can withstand the synchronised global recession. "The policies that are implemented have mitigated the effects of the global financial crisis to the extent that Malaysia did not suffer a hard landing," he said. The Malaysian economy recorded a growth of 10.1 per cent in the first quarter of 2010, its highest quarterly growth in 10 years. The last time Malaysia charted quarterly growth as high was in 2000 when it hit 11.7 per cent. Dr Yeah attributed the record quarterly performance to Najib's sound policies and in particular, the second stimulus package which had helped to boost confidence and reduce job losses. He said the prime minister had steered Malaysia through a rough course and "that phase has passed". "Malaysia's recovery is stronger than projected by market analysts. We recovered in the fourth quarter of last year and the economy expanded by 4.5 per cent," he pointed out. "Of course, the sharp annual growth is also because the economy contracted last year. So when you compare year-on-year, we have a cyclical rebound," he explained. In view of the prime minister's foresight, Dr Yeah said Malaysia was well-positioned towards the next economic boom. Equally upbeat is France's Sorbonne-trained economist Datuk Dr Norraesah Mohamad, who said the prime minister's "quick response" to jumpstart the economy was working according to plan. According to her, one strong reason for the recovery was the RM70 billion stimulus package injected into the economy last year and was still filtering its way down. Meanwhile, Najib has indicated that the GDP growth meant more and better jobs for Malaysians. Bank Negara Malaysia governor Tan Sri Dr Zeti Akhtar Aziz announced an increase in interest rate to counter any spike in inflation following the high growth. The ringgit also ended higher against the US dollar on Thursday on the back of the country's strong gross domestic product (GDP) data for the first quarter this year. The local currency was traded at 3.1950/1000 yesterday compared with 3.2030/2070 on Wednesday. A dealer said the ringgit's strength hinged on the inflow of funds into the equity markets. "The ringgit will be traded between 3.18 and 3.17 against the greenback soon," he said. Extolling the benefits of a strong ringgit, ex-Cabinet Minister and MP for Johor Baharu Datuk Seri Utama Shahrir Samad said that "a stronger ringgit will encourage the import of capital goods which will contribute to innovation and automation of industries in the country." "It will also reduce the government's subsidy bill since petrol, sugar and flour, as the main subsidised products, are all denominated in US dollars. With a reduction in subsidies, the government's operational expenditure and its deficit will also be reduced," he added. MALAYSIA'S central bank is likely to raise its economic growth forecast for 2010 due to the continued improvement of the economy, Bank Negara governor Zeti Akhtar Aziz said yesterday. The central bank had previously forecast that the economy would expand by between 4.5 and 5.5 per cent in real gross domestic product terms. But growth could be considerably higher than that. Indeed, a slew of recent reports from securities houses have suggested that Malaysia could register growth of over 7 per cent this year, with the most bullish forecast (8 per cent) coming from AmResearch. One reason remains last year's sizeable fiscal package (RM67 billion or S$28.7 billion in all) which is still feeding through the Malaysian economy. Indeed, many of the infrastructure projects announced last year - the light rail transit system upgrade and the Pahang-Selangor interstate water transfer package, for example - have yet to be started. Meanwhile, exports have bounced back strongly. According to HSBC, export growth for the first two quarters of this year could 'be over 20 per cent' year-on-year. Rising consumer confidence has also boosted domestic spending. According to HSBC, private consumption is expected to grow 8 per cent year-on-year compared with less than 2 per cent at the end of 2009. This is partly due to the rising prices of palm oil (50 per cent higher than in 2000) and rubber (92 per cent higher). The HSBC report said that Bank Negara was likely to raise rates all the way to 3.25 per cent which was about the level just before the recession hit. The danger for the Malaysian economy, according to private economists, remains the budget deficit (7.6 per cent of GDP last year) and a growing public debt. The latter is now over 52 per cent of GDP and the worry for Kuala Lumpur is that the revenue base isn't growing. More to the point, the government is likely to return to the debt market to finance its deficit. Meanwhile, Mr Najib's bold plans to cut subsidies and introduce new taxes in goods and services - both meant to pare the deficit - still remain on the drawing board. They will have to be implemented if Kuala Lumpur wants a sustainable recovery. It is May 8th, 2010. It is nomination day for Sibu by-election. Since arrival Thursday afternoon, this blogger have been spending many hours till late last night meeting up with local contacts to get a feel for the politics here. So I decided to get a bit more sleep this morning. Anyway, I usually give nomination a miss. It's relevance is grossly over rated. From the reports received, the BN contigent escorting SUPP candidate, Robert Lau Jr to nomination numbered at 2,000. While DAP Chairman and ADUN for Terasek, Wong Ho Leng is accompanied by only a modest 250 with few Pakatan leaders from Semenanjung, including PAS. Will that difference in numbers matter? Unlike in Semenanjung where the number present on nomination day is indicative of the strength of campaign machinery, it is of no relevence in Sibu or generally Sarawak politics. To describe the atmosphere here further, not a single poster is seen about town, except at the party operational headquarters, this morning. PBB had only launched their campaign machinery last night on the eve of nomination day. The hall where they had the occasion at Kg Hilir was still barren yesterday morning. The politics here is not as intense as in by elections in Semenanjung. The level of preparation and state of readiness is minimal. It will be the conjuring act near the end of the campaign that have most impact in turning the outcome. National issues will be raised by the politicians speaking from Kuala Lumpur, particularly from Pakatan Rakyat but it is the local issues that will determine the winner. The winner in this three cornered between BN, DAP and a Malay Independent in a BN stronghold is not determined by the issues but the balancing act of meeting the demand, protecting the interest and the politics within the BN side of the predominantly Foochow Chinese (67.6%), Malay (17.1%) and Iban (14.9%) community. The question is as good as whether BN will win or lose. And that question can only be answered by the Chief Minister, Tan Sri Taib Mahmud who is in the position to answer and address the local grouses. Even the Federal Government needs the State Government commitment before it could commit to play the development campaign. The local grouses are plenty and some have been there for sometime. The local favourite grouse is the perennial flood problem. The problem is such that it affects the structure of homes, roads etc. A bigger issue is NCR land or Native Customary Rights land. The Malays and Iban community have an issue with the father to the candidate Robert Lau. He is taukeh or taiko of KTS Group, a timber-based local conglomorate. KTS helped the late Robert Lau in the development of Sibu Town into its beautiful skyline today. But the man shrewedly tookover Malay NCR land at Kampung Datuk in Sibu Town without due compensations. 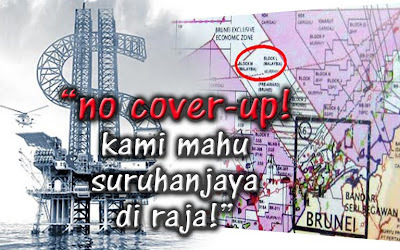 There is another allegation involving Iban NCR land. The Iban is sore to the point of willing to "kasi potong kepala". There is the local legend of the man's stinginess. It is said that he demanded payment from local Ibans seeking use of his sawmill's rejected woods for funeral use. It does not help that Robert Lau Jr, nephew to the late Robert Lau does not speak Malay well and lacks the warmth personality of a politician. There is also the service record of few ADUNs, primarily ADUN Nangka of Sibu to contend with. He has not came down to visit his constituency and fulfill campaign promises. Voters could use this opportunity to teach BN a lesson. All these issues and problems within the two minority communities can be handled and addressed with the right political attitude and will. The more complex issue is within the Chinese community, in particular SUPP. Sarawak Chinese politics are clannish and it is no difference in Sibu. CAndidates is determined locally and even Deputy CM, George Chan can't interfere. Let alone National BN leader. That explains the selection of Robert Lau Jr as candidate. 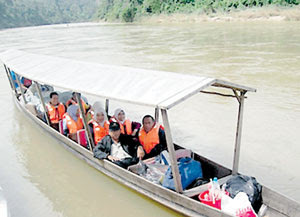 Despite Sibu being considered as one of four "autonomous political territory", there exist rivalry within SUPP Sibu between the clans of Lau, Teong, and Wong. At it's worse, that rivalry could end up into campaign sabotage. There is a view that the Chinese community wish to tap the wrist of the State Government. It is not so much to follow the trend in Hulu Selangor but for repeatedly failing in their campaign promises and address local woes. In all these issues, problems and rivalry, this is where the astute and some described as shrewd political hands of Tan Sri Taib Mahmud comes in. Things are not looking good. It is not because BN is up against an aggresive Pakatan Rakyat and PAS is making their presence here with an office in Kampung Hilir, few yeards from PBB headquarter, but the internal problem and multitude of issues. By Semananjung standard, the campaign machinery is slow to start and seemed too laid back. However this is not Semenanjung. Pakatan Rakyat's with their aggresive style and national issue ceramah may not be acceptable in Sibu. It is heard PAS is sending a big team and we know well how PAS works. DAP Perak lead by Ngeh Koo Ham is trying to penetrate the churches and will intriduce PAS into East Malaysian politics. At the end of it, Sarawak is BN's fixed deposit and loyalty is an important factor. BN will eventually pull through for Robert Lau Jr. DAP realised it because their slogan change and making history. With the most important part of the campaign still far, we shall await for everything to fall in place. Writing off from the BN Media Centre at RH Hotel. While browsing the news through my Blackberry and awaiting my flight this morning, I stumbled upon a Bernama news quoting Dato Shahrir Samad and Dato Dr Noraesah supporting the idea of a stronger ringgit. That's a long overdue measure. Until I am finally settled somewhere, my quick take on these views is a luncheon speech by YBM Tengku Tan Sri Razaleigh Hamzah on January 15th 2009 at at the ASLI's 11th Malaysia Strategic Outlook Conference 2009. Ku Li recomended the same measure to expediate the process to a higher income model. His speech is available here. Unlike the conventional thinking of investment in productivity to achieve higher income model, Ku Li's suggestion appeals to this blogger for strengthening the ringgit has the ability to force our low income thinking producers, manufacturer, and exporters to think within the more productive high income model. Looking at the attitude of our manufacturer, exporter, and producers, unless force to, they woudl prefer to live by the low income model even if at teh detriment to local employment. They would prefer to hire Banglas, Indons, etc, then invest into process, equipment, and etc. KUALA LUMPUR, May 5 (Bernama) -- Malaysia should aim for a stronger ringgit in line with its ambition to be a high-income nation as there are compelling reasons for this uptrend, former Cabinet minister Datuk Seri Utama Shahrir Samad said Wednesday. This, together with the New Economic Model (NEM), was timely and would give Malaysia a shot-in-the-arm to remain competitive, he said. Equally upbeat is Sorbonne-trained economist Datuk Dr Norraesah Mohamad, who attributes the quick recovery in the Malaysian economy to Prime Minister Datuk Seri Najib Tun Razak's "quick response" to jumpstart the economy in the midst of a severe global recession last year. According to her, a strong reason for the recovery is the RM67 billion stimulus package injected into the economy last year which is still filtering its way down. Extolling the virtues of a stronger ringgit, Shahrir said this would encourage the import of capital goods, which would help contribute to innovation and the automation of industries in the country. "It will also reduce the government's subsidy bill since petrol, sugar and flour, as the main subsidised products, are all denominated in US dollars. With a reduction in subsidies, the government's operational expenditure and its deficit will also be reduced." Shahrir said a stronger ringgit would also make travelling abroad more affordable for Malaysians and this would enhance their leisure time. "Above all, a stronger ringgit will help improve the living standards of the people by increasing their purchasing power through cheaper imports and lower inflationary pressure," he said. The ringgit is now hovering at a two-year high against the US dollar at 3.19 compared with 3.42 at the start of the year and last year's peak of 3.72 recorded in March. At nominal terms, the ringgit has appreciated about 6.7 per cent year-to-date against the US dollar. Compared with other regional currencies, the ringgit has gained the most against the greenback since the start of the year. With the strengthening of the ringgit, Malaysians can also look forward to improved export receipts that will create more employment opportunities among the small and medium enterprises. The multiplier effects are beginning to take root in a building boom across the country, according to analysts. Dr Norraesah, who is also an Umno supreme council member, said: "There is more money in the economy. The stability of the economy has led to rising consumer confidence and increased domestic spending. "What this means is that there are more jobs, higher spending power and greater potential for growth." Both local and foreign analysts have been saying that the Malaysian economy is enjoying a strong recovery, with growth this year likely to overshoot most predictions. Some foreign analysts are even predicting growth of 8.0 per cent this year. Singapore's DBS Bank has raised its growth forecast for the Malaysian economy to 8.0 per cent from 5.7 per cent previously, expecting the strongest full-year growth since 1996. The DBS report joins a slew of others from securities houses that had forecast Malaysia could register growth of over 7.0 per cent this year. The most bullish among local securities houses is AmResearch at 8.0 per cent. 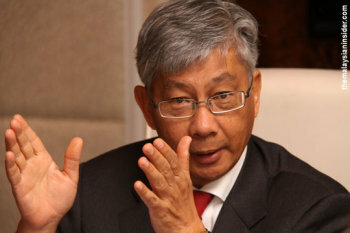 Danny Quah, London School of Economics and Political Science (LSE) economics professor, had stressed the importance of the NEM, saying that despite Malaysia being one of only 13 countries to achieve an annual growth of over 7.0 per cent in the last 25 years, the country has yet to fall within the high-income group of countries. "Without the NEM, we will be overtaken by our competitors such as Vietnam and Indonesia, and Malaysia will fall within the bottom-income group of countries," he told a talk over the weekend. Prof Quah praised the prime minister for implementing the NEM, adding that "I am impressed with the political leadership over its needs for strategic reform initiatives and the acknowledgement that change is needed. "The prime minister is constantly talking about how the market needs to be merit-based and the need for more transparency," said Prof Quah, who also sits on Malaysia's National Economic Advisory Council. Jebat Must Die put up an article here that refute Brunei has sovereignty over the oil fields block L & M.
The oil block is called in Brunei, Block K & J, perhaps in tribute to the son-in-law that was famously known to advise Fa So La Ti Do .... zzz on all matters, probably including the disputed Limbang-for-Oil Field deal. There is a July 3rd, 2003 Straits Times article that explained the situation then. Malaysia was almost going to battle with Brunei over the Block L & M and yet Fa So La Ti Do ... zzz could easily gave the oil field away easy. The proposal calls for a joint-exploration arrangement for the disputed area about 150km off the coast of Sabah. Malaysia is confident of resolving its territorial dispute with Brunei over the ownership of oil-rich waters in the South China Sea. The regional news magazine, Far Eastern Economic Review, reported in its latest issue that Malaysian officials have proposed a joint-exploration arrangement to Brunei. The arrangement is similar to the one Malaysia already has with Thailand. 'We have suggested a joint-development-area type solution,' Foreign Minister Syed Hamid Albar told the magazine. 'We have even suggested that after a certain time passes, we will give up more. What we are looking for is a win-win situation,' he added. The dispute over the oilfield arose after the discovery of oil in the sea some 150km off the coast of Sabah by Malaysia's state-owned oil company, Petronas, in July last year. The field - dubbed Kikeh - has an estimated recoverable reserve of up to 700 million barrels, or 21 per cent of Malaysia's current oil reserves. At current production levels, Malaysia is expected to run out of oil in 15 years' time. The Kikeh discovery is large enough to arrest the decline in the country's oil reserves and provide a helpful cushion for the country's economy, according to the Review. Soon after, Malaysia and Brunei hired prospectors to explore two nearby blocks. Brunei awarded one block to a consortium led by French company Total this year, and is negotiating with a consortium led by Royal Dutch/Shell for the rights to prospect the second. Meanwhile, Malaysia's Petronas has awarded both blocks to a subsidiary and to Murphy Oil. So what are the reasons for the dispute? In 2000, Brunei claimed sovereignty over the blocks as part of an 'exclusive economic zone', or EEZ, which stretches 370km from its coastline. But Malaysia has also long claimed the same area as part of its own EEZ. Analysts say the Kikeh oilfield could extend into the concession that Brunei has awarded to Total. In March, Brunei sent a gunboat to drive away a Murphy Oil drilling ship from the area. The next month, the Malaysian navy sent several gunboats into the disputed area to block the arrival of a Total ship. After a tense stand-off involving a single Brunei patrol craft, Total backed off. Both sides have since stopped all work in the disputed areas. Finally, on May 24, Malaysian Prime Minister Tun Dr. Mahathir Mohamad met Brunei's Sultan Hassanal Bolkiah on Malaysia's Penang island to resolve the issue. Malaysia’s proposal of joint exploration is similar to the one it has with Thailand in exploring oil in the Gulf of Thailand under a 50-50 profit-sharing arrangement. 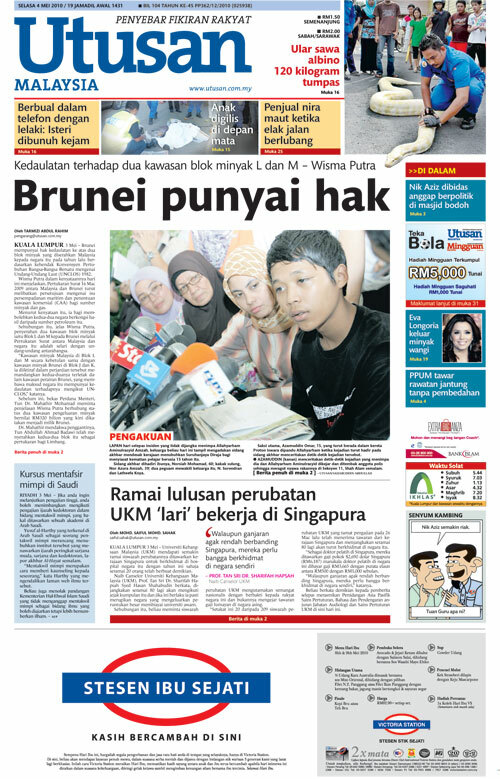 According to the Review, Malaysia may use the dispute as leverage to settle other outstanding issues, such as Malaysia's land border with Brunei near the Limbang River, an issue that has persisted for decades. Dr Tun Dr. Mahathir has promised to resolve the matter before he retires in October. Meanwhile, energy officials in Kuala Lumpur say the dispute 'should be cleared up in two months'. US-based Murphy Oil Corporation released a press statement yesterday saying that Petroliam Nasional Bhd (Petronas) has terminated its production sharing contracts of Blocks L and M (referred to as Blocks J and K in Brunei) as the two blocks are no longer part of Malaysia. “Following the execution of the Exchange of Letters between Malaysia and Brunei on March 16, 2009, the offshore exploration areas designated as Block L and Block M are no longer a part of Malaysia,” the statement added. Now where is the 50:50 profit sharing arrangement that Tun Dr Mahathir proposed. BRUNEI can start drilling soon in offshore Blocks J and K as the Sultanate retains ownership of the two blocks under a deal made last year with the Malaysian government. Second Minister of Foreign Affairs and Trade Pehin Orang Kaya Pekerma Dewa Dato Seri Setia Lim Jock Seng during a telephone interview yesterday confirmed this, adding that "this has been sorted out during last year's agreement and is nothing new". Asked whether Brunei can start drilling in the offshore blocks soon, Pehin Dato Lim said "Yes". 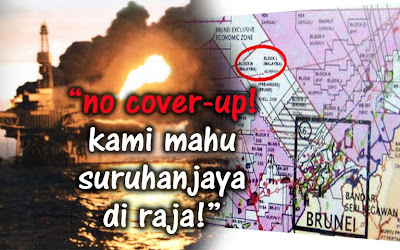 "Following the execution of the Exchange of Letters between Malaysia and Brunei on March 16, 2009, the offshore exploration areas designated as Block L and Block M are no longer a part of Malaysia," the statement added. Yves Grosjean, general manager of Total E&P Borneo BV and Total E&P Deep Offshore Borneo BV, in a telephone interview with The Brunei Times explained that Malaysia refers to Brunei's Blocks J and K as Blocks L and M.
"This could be very good news for us if what Murphy Oil writes is correct, Blocks J and K could be under Brunei's sovereign," he said, adding that they are awaiting more developments on the matter. 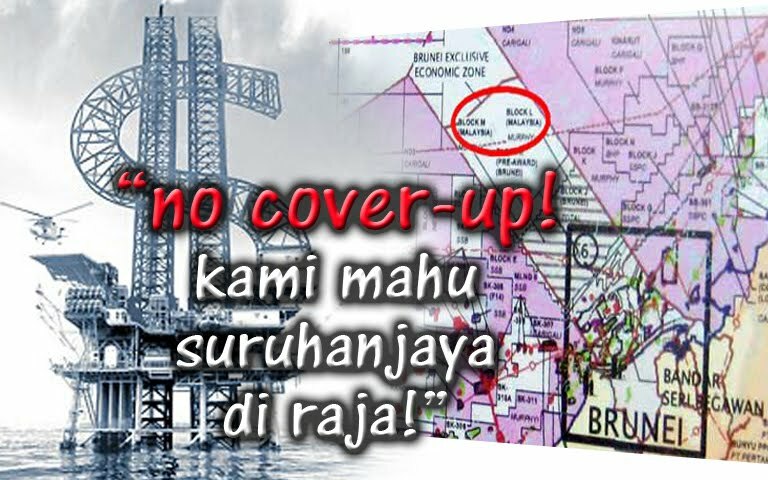 Grosjean also said that Brunei's Block J was previously commissioned to Murphy Oil under Petronas, but wasn't sure about Block K.
According to the petroleum map from the Brunei's Petroleum Unit, Block K was awarded in 2003 to a consortium made up of Shell Deepwater Borneo, Mitsubishi and ConocoPhilips. During last month's State Legislative Council, Pehin Dato Lim said that Brunei and Malaysia would start talks to resolve the land border demarcation issue in April. Pehin Dato Lim also noted the recent establishment of a joint technical committee that would finalise the formalities of the boundary demarcation. The modalities of the final demarcation of land boundaries were included in the Letters of Exchange (LoE), signed by leaders of both countries in March last year. The LoE was intended to settle the long-standing land and maritime boundary issues between the two countries. Grosjean in a previous interview said that Block J is projected to produce more than 150,000 to 200,000 barrels per day, adding that the magnitude of this growth would mean doubling oil production in Brunei. "I think we are lucky. I'm very pleased (that Total was) chosen by the Bruneian government to explore Block J initially and we are pleased to have this relationship. Situations where there are disputed areas are not uncommon, especially in the oil industry or related to hydrocarbons. In actual fact, it usually takes a long time to come to a solution and the fact that we are about seven years into this situation, with positive signs of a conclusion this year, is something commendable for the Bruneian and Malaysian governments," he said, adding that working to an agreeable solution is not so common elsewhere in the world. The Malaysian Embassy in Brunei could not be reached as of press time. Where is the win-win 50:50 profit sharing? Why for only 40 years only and not till it depletes? Please ... call for a Royal Commission. Abdullah have to answer to them. Ini satu cadangan yang baik untuk Dato Najib ambil tindakan segera supaya tidak timbul tuduhan, andaian dan fitnah. Kenyataan yang dibuat oleh Pak Lah dan Petronas baru-baru ini hanya menimbulkan kemusykilan dan spekulasi. Menubuhkan Suruhanjaya Diraja akan menahan dari pelbagai andaian salah dibuat dan khabar angin merebak. Selain itu, dalam menghadapai PRK Sibu, kita tidak mahu orang Sarawak menganggap kerajaan cuba menutup sesuatu dan akhirnya mereka anggap ada pihak memandai memberi negeri mereka kepada negara lain. Kalah nanti ... dah sedap2 menang dua sederet. True enough, Nazri's vitriolic remark and Wisma Putra's statement only raised more questions than answering. The notably obvious is that when Tun Dr Mahathir made the revelation, the mainstream media tries to hush hush by sweeping it to the 4th page. Wisma Putra's statement which only adds more question was given frontpage coverage. In Utusan dated May 2nd, Nazri said Government is not stupid to negotiate to lose. During Pak Lah's time, the Government was not stupid. It is far from stupid but plain dumb to the point of being ridiculous. Do you wanna begin to list the loss the nation had to endure under Abdullah Bodowi, Nazri? How about Pulau Batu Putih to help you recover from amnesia? Please do not attempt to confuse the issue and insult the public intelligence by making a stupid remark to say we did not lose Limbang. For heaven sake, the nation lost Block L & M with the US$100 billion oil reserve. The oil field which is now called Block K & J by Brunei is no joint development but Petronas have to apply to Brunei-Tootal as Contractor? One wonders if this is another of Pak Lah's typical decision made by Khairy during his daytime sedation? PETALING JAYA: Brunei has sovereignty over the two oil-rich petroleum blocks which Malaysia had earlier claimed ownership to according to international law, Malaysia’s Foreign Ministry said. A statement issued by Wisma Putra said Brunei was entitled to exercise sovereign rights over the area under the UN Convention of the Law of the Sea (Unclos) 1982. It said Malaysia acknowledged Brunei’s sovereign rights over the area in the Exchange of Letters signed by the two countries, undertaken by then Prime Minister Tun Abdullah Ahmad Badawi and the Sultan of Brunei Sultan Hassanal Bolkiah. “Malaysia’s oil concession Blocks L and M, which coincided with Brunei’s Blocks J and K, are recognised under the Exchange of Letters as being situated within Brunei’s maritime areas and over which Brunei is entitled to exercise sovereign rights under Unclos,” it said yesterday. The ministry said the Government terminated the production-sharing contracts over the two blocks to Petronas Carigali Sdn Bhd and Murphy Oil, which were awarded in 2003 as a result of the 2009 Letters of Exchange. The letters also provided for the establishment of a commercial arrangement area for oil and gas, where Petronas may join in the exploitation of resources. The ministry said the 2009 Exchange of Letters was the culmination of 20 years of tough negotiations between the two countries. It said the contents of the Exchange of Letters had been approved by the Malaysian Cabinet, and on which the state governments of Sabah and Sarawak had been briefed and consulted. Besides solving the issue of the two countries’ overlapping claim over the stretch of the South China Sea and the establishment of the joint commercial arrangements to exploit oil and gas in the area, the 2009 agreement also provided for the final delimitation of maritime and land boundaries between Brunei and Malaysia. Read the rest in their website here. Without pouring over the content of the report, did anyone realised that Wisma Putra is speaking on behalf of the Brunei Government? If Unclos is dated 1982, are we so dumb not to take that into consideration when we pursue for exploration in 2003? Didn't we had a near skirmishes with the Brunei Navy and later resolved the oil field issue some time back? Why give it away? Why is it that the whole deal is not made transparent to the public and only known more than a year with Dr Mahathir's revelation. Does it mean there is more such hidden deals and agreements of Pak Lah's that is hidden from the public? Does the power on border issues rest only with the Cabinet, which Pak Lah is using for his comfort and defense? Should it not involve Parliament, State and Sovereign? In the case of Sarawak, the Sovereign would be the Yang Dipertua Negeri under appointment from Yang Dipertaun Agong. Could the public be told openly what did Pak Lah disclose to the Cabinet members that made them gave him the approval? Are what was disclose by Pak Lah concurrent with all the terms now? For one, there is no joint development that is being reported. Second, was it Limbang for oil field exchange? If it doesn't tally, the Cabinet could rescind on their approval. Still, why did the press conference which Pak Lah claim Limbang issue solved was meant only for Malaysian press and not for Bruneian press? When Brunei denied that, why was no reply on pour side? Was there really an oil for Limbang deal? The fact that Pak Lah had left for Brunei is adding more curiosity. But let's leave at that for the time being. It just proves that any attempt to cover up by revealing only part of the information will only uncover more. Have a Royal Commission. Even the sovereign need to know too! Najib should not cover Pak Lah's treachery!